Land Rover BAR has launched its latest testing boat – T2 – at the team's home in Portsmouth. This boat will increase the momentum already developed with the initial launch of T1 last October. It's the next stage in the relentless pursuit of technological excellence that will culminate in the design and build of the final race boat to challenge for the America's Cup in 2017. Ben Ainslie, Team Principal and Skipper, four times Olympic gold medallist and America's Cup winner commented: "T2 is an extraordinary achievement; everyone on the design, engineering and shore teams have put everything they have got into this boat. Power is nothing without control, and there has been no compromise in the pursuit of both. All of the sailing team are grateful and privileged to get the opportunity to test fly this unique craft." 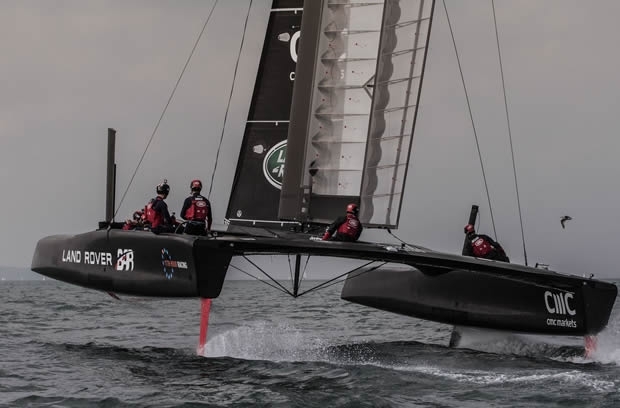 Andy Claughton; Land Rover BAR Chief Technology Officer and two times America's Cup winner: "This is the most technologically advanced sailing boat I've ever been involved with. It's the vital next step on our path to developing the boat that will challenge for the America's Cup, containing some of the most innovative and powerful technology ever used in this competition." Ainslie continued: "All of ​the sail​ing team​ are gra​teful an​d privil​eged to ​get the ​opportun​ity to t​est fly ​this uni​que craf​t"
T2 represents a significant step towards the team's pursuit of power and speed; driving forward a new era of British maritime design and technology. The design combines ideas and concepts previously only found in aerospace and automotive technologies, uniquely, T2 combines the raw power of carbon fibre hydrofoils and a wing sail with sophisticated electronic flight control systems. Land Rover BAR will continue test sailing in the Solent throughout the winter. Next week the team will fly to Bermuda for the final Louis Vuitton America's Cup World Series event of the year.